Water can be made up of a wide range of substances or organisms. They are not necessarily harmful, but may become a contaminant or a nuisance at higher levels. Most contaminants in water cannot be detected by smell, taste or sight. For tap water / drinking water stored in tanks: Although most water suppliers deliver reliably clean and safe water, contamination can happen on the way into your home, or even within the home. This could be through old plumbing or leaking pipes, leaching lead or copper pipes or bacteria contamination in water tanks. Increasing environmental pollution also affects the water, which is used to supply us with drinking water. For private water supplies: Regular testing of water from wells/springs/streams etc is very important as heavy rainfall, seasonal changes in agriculture as well as seasonal changes can affect water quality. Our water test kits contain a range of different tests to give you a wide overview of the quality of your water. Click here for an overview over our multi-packs. Click on each element to jump down to the explanation. Click here to find out why and when you should test your water and water supply. Aluminium is probably the least toxic of all the metals. It is widely used in industry for cans, foils, modern aircrafts etc. In some water sources, aluminium occurs naturally. It can be removed from drinking water by water treatment. It is not clear how aluminium interferes with activities in the human body. Acute aluminium poisoning has been associated with constipation, colicky pain, anorexia, nausea and gastrointestinal irritation, skin problems and lack of energy. Slower and longer-term increases in body aluminium may create muscle twitching, numbness, paralysis, and fatty degeneration of the liver and kidney. The UK maximum contaminant level for Aluminium in tap water set by DWI/DEFRA is 200µg/l (=0.2mg/l)*. Alkalinity is a measure of the capacity of water to neutralise acids. Alkaline compounds in the water such as bicarbonates (baking soda is one type), carbonates, and hydroxides remove H+ ions and lower the acidity of the water (which means an increased pH). Alkalinity is normally due to the bicarbonate salts of calcium and magnesium, and very occasionally sodium bicarbonate may also contribute. Alkalinity & pH of water are very closely linked. Testing both, the pH & alkalinity of water is important, as a very low or very high pH can be an indicator for problems with water quality. This is especially the case for water in swimming pools & spas, aquariums and private water supplies. Alkalinity in water can protect against sudden changes of the pH level. Spas should have Alkalinity of 80 - 160mg/l (ppm). If the alkalinity is below 80mg/l (ppm), then the pH can suddenly change. If a pH is too low, then water can be corrosive for metal parts, ie. lead from lead pipes can leach into water or metal parts may be damaged. If the pH is too high, then a desinfectant can not work properly. If the alkalinity is too high, then it can be very difficult to adapt or change the pH of water. Should it be necessary to change the pH as well as alkalinity of water, then it is recommended to adapt the alkalinity first. NH3, Ammonia Gas, is extremely soluble in water. It is the natural product of decay of organic nitrogen compounds. Although it is widely used and common in our society, ammonia can be both; hazardous and caustic. Ammonia gets into water supplies most frequently as runoff in agricultural areas where it is applied as fertiliser and it easily finds its way into underground aquifers from animal feedlot runoff. Ammonia itself is not often found in well water because bacteria in the soil convert it to nitrates. Ammonia can be very corrosive to some copper plumbing systems. Ammonia is not regulated by current drinking water standards (only guide values). Ammonia is toxic to fish and to dialysis patients. Its toxicity varies with the pH of the water. Treatments: The natural zeolite clinoptilolite, also regenerated with salt, is an effective ammonia treatment. For drinking water, distillation is an effective treatment. Chloramination is an alternative means, which is used to disinfect the water, whereby ammonia is added to chlorine to form a long-lasting disinfectant. It has been in common use within the water industry for many years. The advantage of chloramination is that it persists longer through the distribution pipework and the taste is usually less noticeable to consumers than chlorine alone. Treatment: Chloramine is more difficult to remove from water than free chlorine. It can be removed with exactly the same treatment strategies that are used for chlorine, but greater contact time is needed. Activated Carbon and reverse osmosis units (with at least two carbon prefilters) should remove chloramine nicely, although in both cases ammonia must still be dealt with. The guide value for ammonium (ammonia and ammonium ions) in water is 0.5 mg/l* (ppm). The eXact iDip 570 can test for Ammonia in water. Low levels may occur naturally in water after it has passed through various mineral deposits and rock strata. Arsenic is present in small amounts in soil and therefore is present in our food. It is also in the ocean, which transfers to seafood, especially the filtering mollusks, such as clams and oysters. Some arsenic may also be present as a contaminant in meats. Arsenic is also found in many fuel oils and coal, and hence it is added to the environment when these are burned. Weed killers and some insecticides (particularly lead-arsenate sprays) are the main sources of arsenic contamination. This is responsible for a twentyfold increase in the level of arsenic found in humans. The UK maximum contaminant level for Arsenic in tap water set by DWI/DEFRA is 10µg/l (=0.01mg/l)*. The toxic effects of arsenic contamination can be poisonous. Ingestion of arsenic can be dangerous and lead to illness and in some cases can be fatal. The possible effects of arsenic toxicity include hair loss, dermatitis, diarrhoea and other gastrointestinal symptoms, fatigue, headaches, confusion, muscle pains, red and white blood cell problems, neurological symptoms and liver and kidney damage. Acute arsenic exposure may cause a rapid series of symptoms. Arsine gas exposure is very toxic to the lungs & kidneys and is often fatal. Death from low-level, chronic arsenic exposure has the appearance of death from natural causes. Bacterial contamination can not be detected by taste, smell or sight. Floods, human or animal waste, or insects, rodents or animals entering a well can be a cause for bacteria. Water supplies should be regularly tested. Tests for Total Coliform Bacteria are generally used as a sanitary indicator for the quality of water. Typical types of Coliform Bacteria include Citrobacter, Enterobacter, Hafnia, Klebsiella and Escherichia coli (E.coli). Illnesses caused by E.coli bacteria and other potentially harmful bacteria occur every year. Many strains of bacteria are not toxic, but even mild cases can cause minor illnesses like diarrhea, vomiting, cramps, and other gastrointestinal symptoms. Bacterial infections can be potentially dangerous or fatal, especially in people with weaker immune systems like children or the elderly. The presence of bacteria indicates that treatment systems are not working properly. The UK maximum contaminant level for Coliform bacteria is zero*. E.Coli stands for Escherichia Coliform bacteria, which normally live in the intestines of humans and animals. Most strains of this bacteria are harmless, but one particular strain called O157 can cause severe kidney damage and diarrhea and in some cases renal failure and death. Infection by the O157 strain are regarded as the most dangerous causes of food poisoning in the UK. Because E.coli are always present in human and animal faeces in high numbers, they are used as an indicator of faecal pollution in drinking water. When E.coli are detected, this does not mean that O157 is present but it requires immediate action. All E.coli bacteria can be rapidly inactivated by chlorine and other disinfectants used in the treatment of water supplies. Outbreaks of illnesses are mostly related to poor maintenance of disinfection systems or private water supplies which are not disinfected. E.Coli is part of the group of total coliform bacteria. A total coliform bacteria test kit can detect high levels of such bacteria in the water. Chloride can occur naturally in source water and is a component of common salt. In small amounts, chloride is found in most natural waters and the concentration depends on the mineral content of the earth through which the water flows. Naturally occurring high levels of chloride generally means you will be likely to have hard water, because of chloride's ability to combine with calcium and magnesium. Low to moderate concentrations of chloride may actually make water more palatable and desirable to drink. Chlorides contribute to the total mineral content of water. Chloride will produce a salty taste in water and in high concentrations, it will produce a brackish or briny taste which is undesirable. The maximum guideline of 250 mg/l (ppm) is not health related, but set to avoid taste and corrosion potential*. Although its health risks are comparatively small, chlorine has a strong taste and smell. Chlorine in large amounts causes corrosion of metals and hence reduces the working function of common household appliances like washing machines and dishwashers. Chlorine in water may be present in two forms, free and combined. Free chlorine does the hard work of killing bacteria and oxidising contaminants. When you add chlorine to water, you are actually adding free chlorine. When the free chlorine combines with other contaminants, it becomes combined chlorine, or chloramines. In water, this form of chlorine has very little sanitising ability and no oxidising ability. Total chlorine is the sum of both - combined chlorine and free chlorine. Levels of chlorine should be kept as low as possible whilst ensuring the quality of the water. Typically water companies keep the level of residual disinfectant in the form of free or combined chlorine to 0.5 mg/l (ppm) or less. Should you notice a smell or taste of chlorine occasionally, then this could be due to maintenance work. Health Effects - Chlorine can react with organic matter in the water, such as vegetation decay, and disinfection by-products called Trihalomethanes (THM's). THM's are suspected human carcinogens. Chlorine may also create objectionable taste and odour problems in water. Chlorine can be irritating to the skin upon contact as well as an eye, nose and lung irritant when exposure to the air is encountered. Ingestion of Chlorine can cause stomach discomfort. Chlorine in water can sometimes react with plastics and rubber in plumbing or kitchen appliances. This can make the water taste bitter, metallic, like medicine or disinfectant or TCP. Apparently this taste is not harmful, although it does not taste very nice. Water treatment companies are advised to keep levels of Chlorine in water as low as necessary. Chlorine Dioxide is one of several oxides of chlorine. It is a potent and useful oxidising agent used in water treatment (desinfection) and in bleaching (it is mostly used for pulp bleaching in paper production). It is highly water soluble, especially in cold water. Low levels of chromium can naturally occur in water after it has passed through several mineral deposits and rock strata. Chromium is rarely found in drinking water. The maximum standards of 50 μg/l (0.05mg/l / ppm)* are health related with a large safety factor built in. Copper is an essential nutrient for good health when ingested in very small quantities, and is a naturally occurring element found in natural deposits. Copper is also used extensively in household plumbing. Copper can be found in drinking water from contamination from mining operations, municipal incineration deposits leaching into groundwater or through corrosion from household copper plumbing (usually caused by acidic water). Short term exposure above the recommended levels can cause gastrointestinal problems such as nausea and vomiting. Long term exposure can cause liver or kidney damage. Excessive levels of copper can cause blue/green staining of plumbing fixtures and a metallic taste. The UK maximum contaminant level for copper in tap water set by DWI/DEFRA is 2.0 mg/l (ppm)*. Low levels of cyanide can naturally occur in water after it has passed through several mineral deposits and rock strata. It is rarely found in drinking water. The maximum standards of 50 μg/l (0.05mg/l / ppm)* are health related with a large safety factor built in. Hard water is generally not seen as a health risk, but it is a nuisance, because of a mineral build up around taps and white goods. It can contribute to the inefficient operation or failure of water-using appliances and it reduces soap and detergent performance. Hard water is high in dissolved minerals, most commonly calcium and magnesium. A flammable and corrosive gas, present in some waters, that produces an easily detected offensive "rotten egg" smell to water. It is produced by decaying organic matter, petroleum refining and from sulphate reducing bacteria (bacteria that can convert sulphates and sulphur to sulphide). Hydrogen sulphide is also a weak acid and can also promote corrosion in plumbing lines. More common to well waters than to treated municipal water supplies. Excess hydrogen sulphide can cause an objectionable smell to water and be corrosive to plumbing lines. Odour can be detected in water with a level of 0.5 milligrams per litre (mg/l) by most people. A "swampy" or "musty" odour can be detected below 1.0 milligrams per litre (mg/l). Concentration of hydrogen sulphide over 1.0 milligrams per liter (mg/l) will give water a "rotten egg" smell and makes water corrosive to plumbing. Hydrogen Sulphide smell in tap water: One cause of this smell could be from dissolved hydrogen sulphides (H2S). The methods for treatment vary based on the pH. Options include manganese greensand filter, to chlorination (followed by dechlorination) and then open aeration (followed by an oxidising catalyst filter). It is best to consult a water quality professional for assistance with this issue. Another cause is sulfate-reducing bacteria found in water that feeds on sulfates, creating trace H2S quantities and is generally found on the hot water side of your water. Treatment is to disinfect all plumbing with household bleach and pre-treat the water supply with chlorination to eliminate the bacteria. To remove the chlorine smells, one can use an activated carbon filter. Ferrous iron is colourless and is the result of changing the insoluble element iron to a soluble form in acidic and low oxygen environments. Ferric iron is the result of exposure to air to form insoluble iron (rust) and red-brown staining of plumbing fixtures and laundry. Organic iron or iron bacteria occur when specific microorganisms utilise ferrous iron and air to produce a gelatinous compound. Colloidal iron is observed as suspended matter causing red-pink discoloration to water. Water quality guidelines for iron are provided to assist in managing drinking water for such considerations as taste, colour and odour as well as for corrosion control. Excessive iron will create a rusty color with reddish or orange staining of plumbing fixtures and a metallic taste. If iron bacteria is present, gelatinous sludge may be present on plumbing fixtures or cause pipe encrustation. The UK maximum contaminant level for iron in tap water set by DWI/DEFRA is 200µg/l (=0.2mg/l)*. Drinking water is only one possible source of lead contamination, but it is one of the easiest to tackle. Lead in drinking water is mostly caused by lead pipes especially in houses built prior to the 1930s. If your water is soft or corrosive, this type of water can accelerate the leaching of lead and copper and other metals from your household plumbing and water fixtures. The lead concentration is normally higher when the water is softer, ie. has a lower pH. Lead can be harmful to health, but just how harmful depends on the amount of lead, which has entered the body and where the lead is stored in the body. Until the 20th century, it wasn’t known how dangerous even a small amount of lead can be to humans. When lead enters the body, it can cause damage to the central nervous system as well as cause developmental harm (especially in children and infants), neurological and kidney damage. Once lead has entered the body it is released very slowly, which means ongoing exposure will cause a build up of lead in the body. The amount of lead in water caused by lead piping is greater when the water has been sitting in the pipe for a while, ie. in the first water which is drawn in the morning. It is therefore important to let the water run for a while to flush the pipe before using it. Because lead levels in the water can vary throughout the day, it is recommended to test your drinking water more than once - ideally throughout one day whenever you use your water for consumption. The UK maximum contaminant level for lead in tap water set by DWI/DEFRA is 10µg/l (= 0.01mg/l = 0.01ppm)*. Click here to read more detailed information if you have or think you may have lead pipes in your home. This is a naturally occurring metal, that is found in many types of rocks. It combines with other substances such as oxygen, sulfur or chlorine. Manganese can also be combined with carbon to make organic manganese compounds. Common organic manganese compounds include pesticides, such as maneb or mancozeb and methylcyclopentadienyl manganese tricarbonyl (MMT), a fuel additive in some gasolines. Manganese is an essential trace element and is necessary for good health. Manganese can be found in several food items, including grains and cereals, and is found in high amounts in other foods, such as tea. Longterm exposure to high levels may lead to mental and emotional disturbances and slow and clumsy body movements (called manganism). New studies also seem to suggest that it may contribute towards Parkinson's disease at elevated levels. Manganese is known to block calcium channels and with chronic exposure results in CNS dopamine depletion. Everyone is exposed to small amounts of manganese in air, water and food. At concentrations exceeding 0.1 mg/l, the manganese ion imparts an undesirable taste to beverages and stains plumbing fixtures and laundry (Griffin, 1960). When manganese (II) compounds in solution undergo oxidation, manganese is precipitated, resulting in encrustation problems. At concentrations as low as 0.02 mg/l, manganese can form coatings on water pipes that may later slough off as a black precipitate (Bean, 1974). A number of countries have set maximum standards for manganese of 0.05mg/l, above which problems with discoloration may occur. The UK maximum contaminant level for manganese in tap water set by DWI/DEFRA is 50µg/l (0.05mg/l; 0.05ppm)*. When animal and human wastes or soil fertilisers come into contact with water, they show up as nitrates and nitrites. There has been a 20 fold increase of the use of nitrogen fertilisers in the UK over the past 40 years. These fertilisers are very easily washed off the land into streams and rivers and can eventually end up in drinking water supplies. Only specialised water treatment processes can reduce the amount of nitrate in drinking water. Nitrates and nitrites are especially harmful tor the development of babies and young children and can be a cause of the potentially fatal Blue Baby Syndrome. Since levels of nitrates in waters are being controlled carefully, instances of this illness have reduced massively in the UK. Nitrates are thought to be associated with cancer, because the resulting nitrite can react with amino acids in our body to form nitrosamines, which are thought to be initiators of cancerous growths. Although (to our knowledge) some studies haven't found a definite positive link yet. Some experts recommend testing drinking water for nitrates if a baby is expected, during the early months of a pregnancy, before bringing an infant home and again during the first 6 months of the baby's life. The UK maximum contaminant levels in tap water for Nitrate is 50mg/l and for Nitrite is 0.50mg/l*. Hydrogen Peroxide can be used for water desinfection as well as bleaching of hair and other materials. Hydrogen peroxide solutions look like water and can be dissolved in water unrestrainedly. At high concentrations these solutions give off an irritating, acidic smell. Hydrogen peroxide is inflammable. At low temperatures it becomes solid. Hydrogen peroxide is versatile and is used for different applications, because it is very selective. By changing the reaction conditions (temperature, pH, dose, reaction time and the addition of a catalyser), hydrogen peroxide will attack different pollutions. Hydrogen peroxide is most commonly used to remove pollutants from waste water and from air. It contests bacterial growth (for example bio fouling in water systems) and it can enhance bacterial growth (for example bio remediation of polluted soils and ground water) through oxygen addition. It can also be used to treat pollutions that can be easily oxidised (for example iron and sulphides) and pollutions that are difficult to oxidise (for example dissolved solids, gasoline and pesticides). Finally, it can be used to bleach paper, textile, teeth and hair or to produce food, minerals, petrochemical substances or washing powder. Pesticides are used to eliminate weeds, insects and other harmful elements in crops. An increased use of pesticides in agriculture means that these toxic substances sometimes leak into the soil, rivers, lakes and groundwater, which is used for our drinking water. Public water supplies are encouraged to test water for pesticides, but this is not always the case. It is difficult to test reliably for all pesticides, due to the high number of pesticides available. In addition, often more than one pesticide is used. This means that the chemical compounds in them may react with each other, creating different elements altogether. Tests for coliforms and nitrates are typically used as early indicators of well contamination. But they will not necessarily tell you if you have pesticides or not. The Watersafe City 8-inOne kit includes a test for 2 Pesticides, Simazine and Atrazine. Their use has been prohibited in Europe, but they are still used in many other countries across the globe. The pH scale is the measure of acidity or alkalinity ranging from 0 to 14. The pH of tap water should be in the range of 6.5 to 9.5, which is around neutral and close to alkaline. Acidic water can be corrosive to metals, especially the lead in lead piping. It is important to control the pH of water as a too high or too low pH can be an indicator of other problems in the water. If the pH is too high, then a desinfectant can not work properly, which increases the possibility of the presence of bacteria. Tap water should have a pH of 6.5 to 9.5, rain water can have a pH < 5. Pure water should have a pH of approx 7. The recommended UK pH level in tap water set by DWI/DEFRA should be between 6.5 and 9.5. Sulphates are naturally found in most waters and the amount will vary depending on geographic area. It is a colourless and odourless compound of sulphur and oxygen and exists as a dissolved salt in water. High sulphate generally means you are likely to have hard water, because of sulphate's ability to combine with calcium and magnesium. High sulphates will usually also correspond to high sodium levels and high acidity in your water. Low to moderate concentrations of sulphate may actually make water more palatable and desirable to drink. Sulphates contribute to the total mineral content of water. High levels of sulphates will produce a medicinal taste and can have a laxative effect on the digestive system if you are not accustomed to drinking water with high sulphates. Health concerns regarding sulphate in water have been raised, because of particular concern for groups who may be at greater risk from the laxative effects. Click here for our comparison chart to the various water testing kits. *Correct at time of writing this article (2016). The maximum contaminant guidelines can change. Some of the information above may vary, please check with your local supplier. 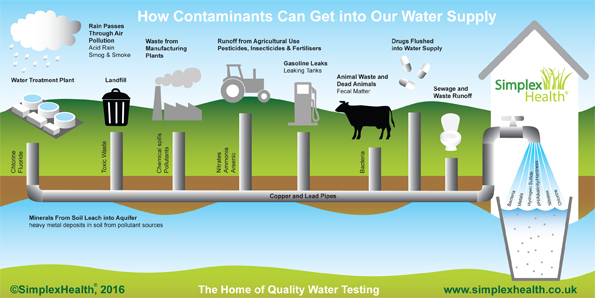 More information, including UK maximum contamination levels for other parameters, can be found on this website: http://dwi.defra.gov.uk/consumers/advice-leaflets/standards.pdf , this is part of the website from the British Drinking Water Inspectorate (DWI/ DEFRA).